October 15, 2010: Happy 25th Birthday Portlandia! 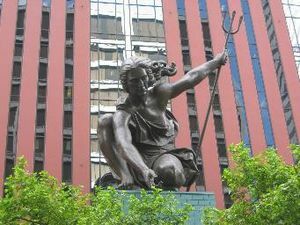 In October of 1985 Portlandia (the hammered-copper statue, not the IFC series) was installed and dedicated above the front entrance of the Portland Building. The Regional Arts And Culture Council and Mayor Sam Adams invite the public to the Standard Plaza across the street from the Portland Building (1120 SW 5th) from 3pm until 3:30pm for a celebration that includes cupcakes! Portlandia, by renowned artist Raymond Kaskey, is made of hammered copper sheeting about the thickness of a dime formed around a steel armature. At 34’ 10”, She is one-third the size of the Statue of Liberty, the only larger statue of this kind in the nation.